Some years ago, an esteemed spiritual teacher advised a distressed student, struggling with lack of self esteem and confidence, to “go and find some ripe bananas” [people with the qualities she wanted to embody] to spend time with. She explained how green bananas ripen faster when put next to ripe bananas and that this is the same with people. We are strongly influenced by those we spend time with or listen to. This turned out to be a sticky teaching for me. In the last few weeks I have been fortunate to have received teaching, and rubbed shoulders, from three such ‘ripe bananas’. This has been a privilege but also a prompt to reflect on what Chogyam Trungpa Rinpoche meant by ‘spiritual materialism’. Chogyam Rinpoche was referring to the consumer-driven tendency, particularly prevalent in the West, to shop around for spiritual teachings from many sources, without committing to testing and exploring in depth any one teaching. So with reference to my last few weeks receiving teaching and spending time with three wise beings from different spiritual traditions, was I engaging in spiritual materialism or searching out spiritual ripe bananas? So the first of these spiritual teachers from whom I received teaching over a two week period, was Shantimayi – the first woman and Westerner to be recognised by her guru, Sri Maharajji, as a Master in the line of Indian Sacha Masters. I had met her once, sixteen years ago, and been impressed by her wisdom. In her almost continuous travels around the world, teaching and listening to thousands, she explicitly avoids being identified as Buddhist, Hindu or any other religion and instead uses the more inclusive description of embodying a ‘heart’ path. I remembered her as a ripe banana and I was not disappointed! In a few days time you will be able to judge for yourselves when we post on this website the 40 minute audio interview I had with her near the end of her visit to Australia. 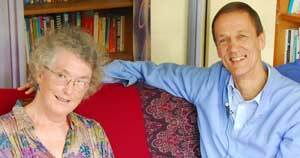 Only a few days after this interview, I had the pleasure of spending the larger part of a day with Dr Ian Gawler and his wife, Ruth. Ian is well known in Australia for his extensive work introducing people living with cancer or other life-threatening illness to meditation and a comprehensive alternative, or complementary, healing strategy to traditional medicine. As a 40-odd-year, remarkable, survivor of metastasised bone cancer that doctors believed incurable, he lost one leg to his disease (when still in his twenties) but has gone on to be a survivor role model and beacon of hope for thousands of people. His strong spiritual interest and belief in the power of meditation to promote healing has, over the last few decades, led him to explore Tibetan Buddhist teachings and to teach mindfulness meditation, and healing visualisations, to large numbers of people. Ian’s experience of meditation is explored in an in-depth interview that will be posted on this site in a few weeks time. For me, his power as a ripe banana has been demonstrated repeatedly by the numerous people with life-threatening illness who have used his help to recover from their illness or heal their lives so that death is experienced with acceptance and love, rather than as a failure or terrifying experience. Finally, I have just returned from a weekend Buddhist retreat on The Thirty-Seven Practices of Bodhisattvas [those committed to compassionate action for the good of all living beings] by Khenpo Ngawang Dhamchoe of the Sakya Vajrayana school of Tibetan Buddhism. Now you would be quite accurate in saying, ‘there’s not much difference between this teaching on compassion and the meditation teaching that Ian Gawler gives’. However, there is one important difference and that is around the question of what motivates you to meditate. Is the meditation focussed on your own healing (and perhaps the healing of your loved ones) or is it focussed on unconditional compassion for all beings, accompanied by a complementary ethical way of life that is explored in depth to distinguish between wholesome and unwholesome emotions, thoughts and behaviours? Today, in the West, there is a lot of interest amongst the public, and amongst psychotherapists and health professionals, in the benefits of meditation practice. Meditation is increasingly recognised as a good technique for reducing stress, encouraging calm, clear mind states that promote wellbeing and enhanced performance in many valued activities, such as sport, public speaking and confidence in the workplace. This is good and very beneficial for many. However, meditation practice is not the whole picture. Many believe they have taken the cream of Buddhist teaching when they adopt a meditation practice and they don’t realise the immense additional benefit of the extensive study and understanding of mind and what produces suffering or wellbeing, developed in Buddhist philosophy over thousands of years. So my perspective is that there is a significant difference between the giving and attending of teachings on Buddhist philosophy and practices, versus the giving and attending of teachings on a particular type of meditation. So back now to the question of distinguishing between spiritual materialism and seeking exposure to wise beings from a range of traditions and disciplines. My view is that the danger of being caught in spiritual materialism, with the consequence of remaining at a superficial level of understanding of a range of spiritual teachings, is averted if one is committed to a particular philosophy, framework or religion and one tests the validity and usefulness of other teachings against this yardstick. For example, I was committed to the Buddhist Vajrayana teaching given by my guru, the Venerable Namgyal Rinpoche, before I started studying social work, followed by psychodynamic psychotherapy, in the 1980’s and ’90’s. I found that I tested all the teachings I got from these disciplines against my Buddhist framework. It was amazing to discover how inclusive this framework was. Almost everything seemed to fit inside! I have continued this testing process ever since and have found that the many learnings, from many sources, gained over the years has strengthened my commitment to Buddhadharma. 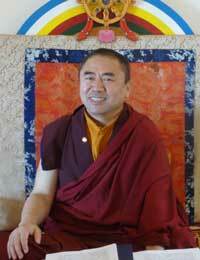 I have taken to heart Namgyal Rinpoche’s persistent emphasis that the path of spiritual growth is a path of question. It is a path of following your interest, with mindful awareness of the consequences of all that you do or fail to do. It is a path of interest and therefore I aspire to be open to learning at all times and from all sources. So, in conclusion, I would like to share with you my gratitude for the learning I have received in the last few weeks from these wise beings. My seeking out of spiritual ‘ripe bananas’ has not been an example of spiritual materialism. Do you have any thoughts on spiritual materialism or your experience of the benefits of seeking the company of ripe bananas? I would love to hear from you. I found the phrase: go and lie with some ripe bananas’ very good instruction from your teacher. Very open minded also, as many teachers try to frighten you off from investigating other perspectives in your quest leading to enlightenment. Personally, I have always thoroughly studied one philosophy before embarking on the next, intuitively knowing that there couldn’t be an end to learning or an end to ‘truth’. Now I still read, attend lectures and retreats, meditate, but consult only one teacher: my inner being. I see the beauty of many philosophies and take what I like, I nip at each one like a bee, satisfying my hunger for that day. Thank you for making your thoughts available and helping others thus. Kindest regards, Danuta. Thanks for your comment. I, too, find that my inner guru/inner knowing is the true guide. I guess it was that inner guide that I was referring to when I wrote about testing all subsequent teachings against the original teaching I received from my, now dead, teacher. There are, indeed, many beautiful jewels to be viewed in a range of philosophies but I do agree with Chogyal Trungpa Rinpoche that we do also need to beware of just becoming ‘collectors,’ rather than practitioners or depth explorers. Thanks, Diane, for your comment. It’s a good point you make about the benefits of starting with ‘spiritual materialism’, or ‘shopping around’ spiritual teachings and practices. As in all things, it is good to have an open mind and a bit of research is always a good practice. I also agree with you that many of these ‘ripe bananas’ are to be found in our own family, our colleagues, friends and teachers of various disciplines. We are so fortunate! Thanks Jacqui for this article. ‘spiritual materialism’ can be for many a starting block to journey further into more depth. For others they find it difficult to go below the surface and are quite happy to go on seeking. Perhaps it really is to do with timing and the different stages of their I AM. For me it has been a real journey and I believe that my life is continually blessed by many ‘ripe bananas’ from colleagues, supervisors, clients, yoga teachers, friends and some of my family who have given me the gift of their wisdom.